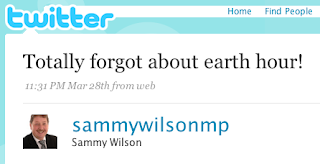 Sammy Wilson's a fake twit! The DUP say it's a fake account, so the potential enjoyment and humour that can be extracted from Sammy Wilson's musings on Twitter may be short-lived. Totally forgot about earth hour! Putting the bin out before bed. @sirwiggum I don't recycle, I just put the bins out! I think after yesterday's football riots, our national sport should be stock car racing, perhaps some MLAs could use their 4 litre SUVs. Can't remember how to change the time on the heating. Pity it was too early to be an April Fool impersonation! Update - looks like Jim Allister is now being mocked online too. Belfast’s Film Festival – the 9th Jameson Belfast Film Festival to give it its full title – kicked off on Thursday night. Over 130 screenings from over 30 countries. Feature length films as well as shorts. Documentaries as well as drama. New Irish cinema, Indian films, World cinema. David Hammond - The Music of Film – Tuesday 31 March at 8pm – a tribute to the life and work of the late David Hammond, including a showing of The Magic Fiddle followed by a performance by Arty McGlynn (guitar) and Nollaig Casey (fiddle). Primeval is back on ITV tonight. While I normally get drawn in for a couple of episodes, there are just too many dinosaurs for my liking. Roaaaaaaaar. When it comes to watching sport, I don’t. With only two exceptions: the London Marathon and the University Boat Race between Cambridge and Oxford. Two sporting events where the participants put in a lot of training and expend an enormous amount of energy pounding around the familiar streets and pulling themselves through the water along the Thames. Two events in which I don’t break sweat as I watch them! Revelling in other people’s preparation and team work. Wonder what that says about me?! I normally blog about the University Boat Race after the event. This year, I’ll warn you know in advance that the 155th meeting between Cambridge and Oxford is on ITV1 (UTV) on Sunday from 2.20pm to 4.30pm. As usual, watch out for the sleight of hand as the presenters transfer from the start line to the finish (on a fast boat up the river) just before the race starts. ITV are giving up their rights to broadcast the boat race twelve month early, and it was announced a couple of weeks ago that the race will switch back to the BBC from 2010. PS: Clocks go forward tonight. It was nice to get inside the renovated and recently reopened Ulster Hall at lunchtime for one of the final fringe events. The phrase "lunchtime recital" conjures up a mental image of musicians in black clothes performing in front of an earnest audience - some of whom will be wishing they'd had something to eat before it started, the rest regretting the indigestion that follows having eaten so quickly. Although the reality of today's lunchtime recital involved musicians, black clothes and an earnest audience, it was quite different to anything I'd expected. The music came out of a "collaboration between ... classical musician[s] and one of top Belfast electronic artists. Each ... will compose and perform a new piece together." And so it came to be that Ciarán Maher sat at the piano (with his iPhone perched like a music manuscript) and kicked off the performance by playing discordant chords and riffs over a subtle ambient background provided by Barry and his Electronic Electric Workshop. 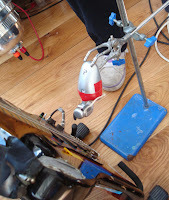 After a while a battery operated fan (with string replacing the fan blades) mounted on a retort stand was switched on and Barry took the lead in the melody making. And later, Gráinne Maher closed her eyes and hummed, oohed and aahed into the mic, and sang with herself and over the tinkling, gurgling and mechanical strumming coming from Barry's toy chest of noise sound. Near the beginning a delightful young girl elegantly wandered across the room in front of the performers, twirling around as she meandered from side to side. In my head I knew she wasn't part of the performance, yet in my heart I saw her action as part of the overall effect. I'm being harsh - in fact, I'm being slightly ignorant - as I'm new to the ambient scene, and in fact I think I'll never be in the ambient scene. It might be cruel to remark that the (male) beard count was high in the audience. 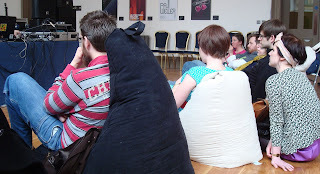 People lay back on bean bags in the front row, sat forward in their seats around tables, or leant against the bar at the back of the space. Many drank beer, which on reflection may have helped them enjoy the mellow mood music and certainly would have stopped them asking themselves questions beginning with what and why! Others stared at their phones or typed on their Blackberries. I was out of my depth, though in no way out of my comfort zone. The Group Space in the Ulster Hall with its bright clean lines, and a great view out its windows of old architecture on the other side of the road, provided a tranquil and undemanding venue and a refreshing space in the middle of a manic week. As regular readers of AiB will know by now, just because one person's art is another's torture isn't a good enough reason for me to be down on something. So I enjoyed it ... even if I didn't quite appreciate what was going on! So thanks to Adam for all his hard work pulling together the Ulster Hall reopening fringe events, and a quick reminder that it's not too late to call into the Adult Electronic Crèche on Saturday afternoon at 2pm for some downtime, free wifi and a turn on the Wii, or pop in at the same time to make the case for your favourite Northern Ireland musical icon ("person, place or thing") at AntIcon. "What makes a speech powerful enough to inspire hope, rebellion, or even terror? Is it the words or the speaker, or simply a case of being in the right place in the right time? Can a speech work taken out of its original context? Over four Sundays, a number of anti-establishment speeches from history will be performed as an experiment to find out why some words may have changed history… and not always for the better. Every sermon will also feature different musical guests." Sunday evening sees the last event of the fringe with Che Cuevara's speech performed alongside music from Tin Pot Operation. Will his words ring true in 2009's Northern Ireland setting? Today, bmi celebrates 25 years of operating a route between Belfast and Heathrow. Starting out at Belfast International, I remember well the period of overlap when they bizarrely - but conveniently - flew out of both Belfast International and Belfast City. Roughly at the point that BA pulled out of the route! I’m sure there’s a story to explain why they made the (commercial) decision to keep a foot in both camps for those months. And in the last eight years or so, they’ve just been flying out of Belfast City Airport, leaving bmibaby to hold the fort up at the big airport. Though when Cheryl and I flew off to Heathrow on honeymoon all those years ago, bad weather meant that we had to be bussed up to Aldergrove as the plane hadn’t been able to land at the harbour. The eventual take-off was quite a memorable experience - a story I’ll reserve for a real life encounter. So happy birthday bmi. Maybe see you soon for some cheese and crackers. At first I thought it was yet another story about tribalism and Belfast's ever-lengthening peace walls. "Belfast to host fencing world championships"
But no, it's a lot more positive than that. The story is about the city hosting the Junior and Cadet Fencing World Championships in April. The "athletes from 85 countries across the globe go head to head" (more like spike to spike) "in individual and team competitions in both the men's and women's Foil, Epee and Sabre weapons", all taking place at the University of Ulster's recently upgraded sporting facilities out at Jordanstown that were opened by Lord Coe back in November. Entry is free to spectate at the competition events that will run from Sunday 5-Monday 13 April out at Jordanstown. The programme is available, though no start/finish times yet. You're also free to dream up suitable captions for the picture of DCAL Minister Gregory Campbell that UU used to illustrate their press release, or to generate puns to describe the event and point them out to me in the comments below! Update - You can follow the championship and look back at the competition on their blog. The European Parliamentary elections are coming up on 4 June. If you've moved house recently or never voted before, then you'll need to make sure your registration is accurate so that you'll have a chance to exercise your right (and responsibility) to vote in the election. This week is the Electoral Commission's Register To Vote Week,and to make the normally arcane form filling slightly more user friendly, there's a website to help. There are a couple of books that have been needlessly cluttering up my bedside table for the last week or so. Books that have actually been finished for a while. One of those is Q&A by Vikas Swarup. It’s the original novel that was adapted into the screenplay for the film Slumdog Millionaire which I mentioned back in February. While the form and basic storyline is familiar from the film, there are quite big differences. To avoid copyright/licensing issues, the TV show forming the spine of the book is called Q&A, but feels pretty familiar to anyone who’s watched Who Wants To Be A Millionaire. Some of the names, relationships and circumstances are different too, and it would be easy to turn this into a what’s-different-between-the-film-and-the-book post, pointing out that the Jamal character played by Dev Patel is instead Ram Mohammad Thomas etc ... and to some extent I’m finding it unavoidable! The book is quite slowly paced, taking time to examine the twelve vignettes of Ram’s life experience that allowed him to correctly answer the questions. Some were obviously very strong ideas and visually distinctive enough to make it all the way into the film. Others were not taken forward. In a way the original book and the film make different points. The film becomes a fairy tale about betrayal and redemption, with the final act chasing through Mumbai to get to the train station to find a girl. Whereas the book is less rushed and less complicated. There’s unrequited love in there too, but it’s less Hollywood/Bollywood and more unexpected. If anything, after the adventure ride to get there, the book ended too quietly, too simply, kind of folding its arms and giving out a little satisfied sigh. But the plots within the chapter were fascinating, and it was still a good read. It will be interesting to see what Vikas Swarup does with his next novel. Like last year, the weather was good on St Patrick's Day. Unlike last year, I didn't get outside to enjoy it, but sat glued to the phone (actually hovering above a speaker phone) for seven hours working through the chaos that is the end of the financial year. 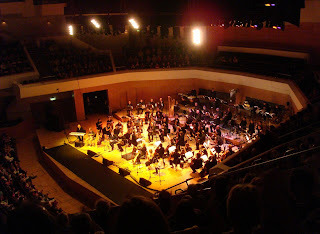 But in the evening we tootled up to the Waterfront Hall to enjoy this year's St Patrick's Day concert, organised by BBC Radio Ulster and Belfast City Council. Last year featured the music of Shaun Davey. This year it was the turn of Bill Whelan - best known for the 1994 Eurovision interval act Riverdance - but the composer behind many other gripping pieces. Not too diddle-dee-dee. But a mix of mature music to sit back and enjoy after a hard day's work. The first half dominated by the enormous (augmented?) 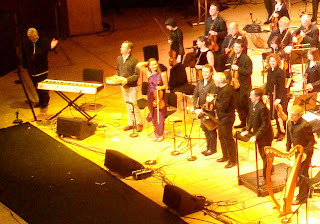 string section of the Ulster Orchestra, and the second half become more boisterous, ending in a crescendo with the seven minute orchestrated version of Riverdance. A great night, in great company. To go all tabloid for a minute, you'll be able to spot Sharon Corr on fiddle in the shot below. Worth a listen until it drops off the end of Listen Again next Tuesday. Update - The answer was ... unfortunately aboard one of the Ryanair planes that is trialling in-flight mobile phone usage. Incoming texts are free, but everything else bears a surcharge. Ever been overcharged by £17,000 by a hotel? Going through some old papers I came across a printout of one of the most unusual emails I’ve ever received in 14½ years of work. Back at the beginning of May 2005, I’d stayed for a couple of nights in a training centre for a work team meeting. The bill had been charged directly to my business unit directly rather than being settled by credit card, so I hadn’t been given an invoice showing the final amount to sign when I checked out. Heard the one about the disposable book? 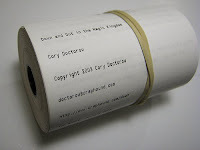 We've had real books, e-books ... and now Roo Reynolds is experimenting with disposable books printed on thermal till paper! Finished that chapter? Then tear it off and chuck it away! Eat your heart out Kindle! And on a related note, the latest episode of the weekly Outlaw podcast was tackling the issue of whether text-to-speech software on e-book-readers will damage sales of audio books and whether it breaches copyright by creating a derivative work. Only 10 minutes long - worth a listen. In one corner, nine teens and twenty-year olds are sitting around a table, having divested a couple of other nearby tables of their chairs. They're all leant forward, earnestly discussing and planning. An occasional titter circles around the group and then they settle again. Sorry for stereotyping, but they have the look of Christians planning a youth event somewhere the parking was free and the coffee trendy. At another table up in this balcony vantage point, a thirteen year old is baby sitting his 12-18 month old sister while his Mum does the shopping in the aisles visible below. He's not making as much headway with his muffin as the toddler is with the enormous cookie he chose for her. She giggles every now and again. It's not busy and all the while, the barista is chatting up two young students while his colleague follows the recipe for their drink. He announces that his tax is paying for their caramel. A courting couple - no rings! - sit opposite each other on the brown comfy seats, clasping their life-giving grande mugs of steaming caffeine, not talking to each other. Just resting in each other's company. Me, I'm sitting down having done the weekly shopping up the road in Sainsburys, but their cafe closed much earlier. Tesco's cafe is open - except it's a Buckstars franchise. So no one over forty in sight. Isn't this some kind of indirect discrimination - the only food and drink outlet in the store doesn't cater for the older, tired shopper? They're giving away "complimentary grounds for your garden" - something I remember lugging across on a plane from a London Starbucks as an extra special Christmas present three years ago. Conservatives & Unionists - a new farce - but for how much longer? Looks like Slugger O’Toole got the scoop on this morning’s falling out between a senior NI Conservative and the UUP. When David Cameron appeared in Belfast back in December, he made much of the fact that he wanted to open up voting Conservative to all communities, not just traditional Ulster Unionist voters. Thinking back to conversations with UUP activists, and then listening to Jeffrey Peel’s side of the story when he spoke on Talkback at lunchtime today, explaining his resignation from the joint committee set up between the UUP and the Tories, one of my initial suspicions now seems well founded. Many in the UUP have little respect for local Tory activists, and sought to eliminate them and their Conservatives NI party structure from the local scene through the “New Force” arrangement. Back in December, at the public Cameron Direct event, the Conservatives’ leader talked about “launching a new force in Northern Irish politics” to get away from traditional unionist versus nationalist and move to a politics that would be about education and “mending broken parts of society”. The first question asked how he’d be able to follow through on his appeal to Catholics to support the Conservatives in Northern Ireland given the close links with a Unionist party. It’s beginning to look like the problem with being unequally yoked is that one party ends up setting the direction while the other finds their feet off the ground and unable to influence what’s going on. Jeff Peel has escaped from his side of the yoke ... but his party are still in bed with the UUP. With the UUP’s only MP Lady Sylvia Hermon likely to either resign her North Down seat at the next general election or run as an independent (supported by the Alliance), the UUP’s focus will surely continue to be on regional politics. It’s become a new farce that is a far cry from the new force that Cameron promised. Though at least Cameron was realistic about the risk they were taking with each other. Looks like his statement and resignation from the joint UUP/Tory committee may not have been deemed to have followed party protocol. There’s something of the Emperor’s got no clothes about this episode. Not being a member of any political party, I can still see why they have rules about how members and party officials make decisions and communicate those with the media and the public. On the other hand, being a whistleblower is rarely a stance that is welcomed with open arms by any of the groups affected. It’s going to be a day dominated by the reopening of the Ulster Hall, and people’s reminiscences of concerts, gigs and events in the years gone by. If the number contractors’ vans parked outside the front of the building early this morning are anything to go on, there’s a lot of effort going into clearing the snagging list before tonight’s opening concert. While I've many memories of the Ulster Hall appearing in news bulletins over the last 25 years - mostly the scenes of fairly excited political rallies - my own connection with the Ulster Hall probably started with a Nana Mouskouri concert that I went to along with a friend’s family. I was probably about 13 or 14 15 years old, and I think it was the first concert I’d ever been to. [Update - her website suggests either Wednesday 28 or Thursday 29 September 1998!] Seated about 10 rows from the front, the stage was dominated by an enormous black speaker stack on either side, while an impossibly-large array of keyboards were played by the composer of most of her music. But perhaps the biggest memory from that night was of Mouskouri standing at the very front of the stage for one song, with no mic, no reverb, and no accompaniment. Her toes gripped the edge of the stage. And yet she filled the hall with her pure voice singing Amazing Grace. Quick little known fact is that Mouskouri was elected as a Greek MEP in 1994–1999. [Update - so she was an MEP when she sang in Belfast! Imagine that, a touring MEP ...] She’s unlikely to appear in the Ulster Hall reopening festivities, since she performed her farewell tour in 2008, and gave last concert in Athens about seven months ago. I can also remember getting the train down to the Ulster Hall with school friends from Lisburn to go to Mannafest in the early nineties, and then repeating history by driving youth groups there ten years later. In the intervening time, either the music had got louder, or my hearing was less willing to put up with the abuse it once had. But the trip to Burger King or McDonalds afterwards hadn’t changed. The Ulster Hall also tended to host the IEE’s Faraday Lectures (now the IET) if and when they bothered to come across to Northern Ireland. Just before we got engaged, we spent a Valentines Day in 2002 at the free lecture/presentation on Smart Living @ Home with Technology. Funny enough, we got a table in Pizza Express across the road without a problem despite the romantic date. Tonight’s Ulster Hall reopening concert is unsurprisingly sold out, as is Across the Line’s Remember the First Time on Monday night featuring an enormous number of local acts and artists who have played the Ulster Hall over the years. Ash, Divine Comedy, Therapy?, Duke Special, Foy Vance, Ian Archer, Fighting with Wire, LaFaro, Kowalski, The Lowly Knights, Cashier No.9, Jet Plane Landing, Panama Kings. That’ll be some sound check! Catch the ATL concert on Radio Ulster from 7.30pm on Monday 9th, with highlights on BBC2 at 9pm on St Patrick’s Day. Update - And if you're interested in exploring the revamped Ulster Hall and its architecture with a camera in hand, join the Flickr Meetup on Saturday 14 March at noon which will be taking a look behind the scenes. 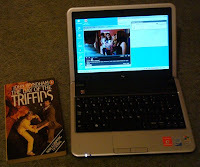 For the last three weeks or so I’ve been travelling around with a Vodafone-powered Dell Inspiron Mini 9 netbook tucked into my bag, using it as and when it seemed appropriate. It’s been a remarkably convenient tool to have to hand, and one that I’ll miss now that the review period is over and it has been boxed up and returned. I’d held off posting for a few days while waiting for Vodafone to respond to a couple of queries ... but I’ll post again if/when the answers come through. After a long fallow period of travel, I’ve been across in Croydon and London several times in the last few weeks. It’s been delightful to be able to scribble type up a blog entry on MS Works while on the train, or catch up on a downloaded 4oD/iPlayer show on the plane. Skype installs and runs like a dream, with the in-built webcam (and associated light) supporting video conversations over 3G. Size wise, it’s a triumph. Light enough and small enough to slip into your bag without a problem. Even squeezes into my coat pocket ... just. The nine inch screen (8.9" to be precise) is just right for playing back downloaded video - much larger and the artefacts of compression would start to appear. 1024x600, with much larger resolutions supported on the external VGA displays. Not so sure about the gloss finish in front of the screen – useful to see who’s ogling over your shoulder or combing your hair in a cheap hotel room – but picks up a lot of fingerprints and is a bit too reflective in bright environments. Three USB2.0 ports, ethernet, mic input and headphones output, media card reader, as well as the all important Kensington lock tethering point. I’d no problems with the built-in wifi – happily connecting to home and airport networks – and there’s Bluetooth in there too. The really neat thing about the Dell Mini 9 is that it was a built in 3G/GPRS modem and SIM card slot, so there are no trailing 3G dongles. Major convenience boon. Where Vodafone’s 3G+ service (HSDPA) is available, it’ll connect at speeds of up to 1.8Mbps (or 7.2Mbps in a growing number of areas). Otherwise it’s 3G at 500Kbps and reverting to GPRS (at its pedestrian 56-114Kbps) elsewhere. 3G+/3G is good enough to watch streamed iPlayer content - though expect the occasional pause for rebuffering. Talking to a member of staff in a Vodafone retail store, he explained that practically everyone buys the laptop with the 1GB package. Although you can trade up to a higher bandwidth tariff during the contract period, no one has ever come in to ask. He reckoned most customers were taking advantage of free wireless at home and in outlets like McDonalds, and rarely relied on the 3G connectivity. I certainly found myself quickly flipping the wifi on to see if there was a connection about before running up the 3G connection software. Though there were a lot of times - trains, hotels with expensive wireless and airports that 3G was the easiest option. The connection software helps you monitor your usage over the month. And it becomes very natural to look for a friendly wifi service before cranking up the 3G when you can't find any. Being driven down from Lisburn to Cavan two weeks ago, a vague road diversion rendered the car’s GPS useless, and so the magic of Google Maps and 3G (while still on the main A4) and then GPRS (once away from the main roads) rescued us. And as we got close to the border – though not necessarily over it – the perennial Irish roaming problem popped up in a dialogue box with a stronger signal from Vodafone IE than Vodafone UK. Unlike my poor experience with 3 in January, at home in Lisburn there’s a strong Vodafone 3G+ signal, with 4 or 5 bars in exactly the same location the 3 dongle failed to get over 2/3 bars and tended towards dropping out. Going through Stansted last week, I did noticed that while airside (the main eating hall and around gate 85) there was no 3G+ signal, only 3G from the terminal pico-cells, while out on the tarmac and in the metal tube of a plane, 3G+/HSDPA comes back! With a 1.6GHz Atom chip, 1GB of memory and a 8GB of SSD hard drive capacity, it’s no flying machine. But XP copes admirably, and as long as you’re a little bit patient, don’t want to store too much data on-board and don’t do too many things at once – and who would want to with a nine inch display – it’s perfectly adequate. Microsoft’s cheap deal on XP licences for netbooks limits manufacturers to supplying machines with a maximum of 1GB of memory ... but there’s nothing to stop you removing two screws on the back panel, popping out the 1GB and replacing it with a suitable 2GB board if you think it’ll make a difference. On the storage front, Dell are now only selling the XP Mini 9s with 16GB of SSD storage, but I guess the 8GB SSD keeps the cost down for Vodafone. You can pick up a 32GB SD card for the slot on the left hand side of the laptop if you need more media storage. Battery life wasn’t quite as good as I hoped ... with the battery half drained by a bit of surfing while waiting for a flight and a 40 minutes of video on board. While video keeps the display powered up, SSD storage means that there’s no hard drive to keep spinning – but the review machine wasn’t brand new, so the 4-cell battery may not have been in tip top condition. 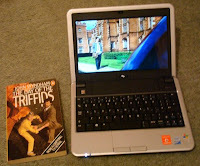 Certainly not as good as Cheryl's Eee PC 1000H which goes on and on and on ... but it’s a smaller machine with a smaller battery. Overall, it was with reluctance that I let this machine out of my hands on Tuesday. It was a useful, comfortable and hassle free machine to cart around and use. If Vodafone’s Liveguy had visited Belfast during their November promotion, he’d certainly have been able to give away his three laptops, and probably tempted a lot of shoppers into buying them at the local Vodafone stores. The big question is would I buy one? It’s very, very tempting! The consumer retail prices start at £25/month for a 24 month 1GB contract (£30/month for 24 month 3GB) with the laptop thrown in "for free" - and first three month’s rental waived if you sign up before the end of March. The business tariffs are a bit more flexible, giving the option of buying the laptop up front, leaving a much smaller monthly contract for the 3G package. I'll comment on the tariffs in a future post once Vodafone confirm how accessible the business tariffs are to normal punters. Of course, Dell have just upped the stakes and announced the Mini 10 – a zippier processor, larger hard drive (though an actual spinning drive and not SSD), and a slightly larger screen and case which allows for a marginally larger keyboard (more like the Eee PC 1000H) lacking many of the irks of the Mini 9. No dedicated function keys, a tiny right hand shift key, and just a smidgen too small to touch type accurately on for an extended period. That would be ideal! Except there’s no official mention in the specs of it having a 3G/HSDPA modem built in, so it’ll probably only be an option for mobile providers to supply. Wonder will Vodafone be offering it? I’d buy a 3G Mini 10 tomorrow. It would be wonderful to see Vodafone offering a Northern Irish friendly mobile broadband roaming deal that took into account the lack of Faraday cages along the land border with the Republic of Ireland ... to avoid the extortionate £9.99/day (for 15MB) roaming charges. In summary, a great package, and if you want connectivity to the cloud while on the move without the hassle of remembering to bring your USB 3G dongle (and don't need to move between devices), then take a look at Vodafone's Mini 9 and if you can, try juggling tariffs between the different consumer and business contract lengths and monthly bandwidth options to find one that suits you. Back in December, I posted about the Shenley Nativity ... taking the idea from BBC's Liverpool Nativity and giving it a Milton Keynes twist. The video from the event has now gone online at YouTube. Something for church youth workers and ministers who read this blog to have a think about as they plan for the rest of this year. Maybe there'll be a Lisburn Passion? Will Moving Wallpaper have a short-lived Renaissance? I was tempted to entitle this post “watching paint dry”, but that would have been a cheap headline. The first series of Moving Wallpaper went out on ITV1 on Friday nights last year. An ambitious twin programme strand. Moving Wallpaper, the dramatised behind-the-scenes show about the disastrous production of Echo Beach (an Australian-looking soap set on a Cornish beach) which was shown immediately afterwards. Echo Beach never really stood on its own as a show. It was propped up by the wittier and darker Moving Wallpaper. Neither show performed well in the ratings charts. In the end, ITV ditched Echo Beach, but bravely recommissioned Moving Wallpaper. And so on Friday night, the first episode of the second series started with the production team being told that their show Echo Beach had been cancelled. But thanks to the unfortunate death of a struggling writer, and a clause buried in the minutiae of the insensitive producer’s (Jonathan Pope, played by Ben Stiller) contract, they have a new show to pilot ... a well named zombie show called Renaissance. The film Five Minutes of Heaven starring Liam Neeson and James Nesbitt - which premiered in the cinema a week or so ago and will appear on BBC1 NI fairly soon - includes scenes where a TV production company display selfish and insincere qualities. Scenes that may well upset real journalists and producers who dislike the portrayal and feel it undermines their genuine and professional approach. However, Moving Wallpaper takes industry discomfort and misrepresentation to a whole new extreme level. It is now for the television industry what Drop the Dead Donkey was for the newspaper trade ten years ago. A cutting look at the worst behaviours and practices of the media. Quite fun to watch if you’re not easily upset. Quite short to watch - only 22 minutes of show when all the ads squeezed in. It’s not quite watching paint dry, but it does need a few more jokes and visual gags squeezed in to keep it moving. And must have been quite cheap to produce given the tiny cast and small number of sets. But perhaps like Drop the Dead Donkey, it should have found its home on Channel 4 and not ITV1. Available on ITV’s catch-up service if you can bear the ads. Given Friday night’s ratings (Moving Wallpaper was the least watched terrestrial show with just 2.1 million viewers, a 9.1% share), ITV’s accountants may have the final say on whether the show survives in its 9pm slot until the end of the series. And if you look on the show’s ITV webpage, the banner has the timeslot overlaid on a blank box instead of hard coding “Fridays, 9pm” into the graphic. Planning ahead in case it becomes stripped and replaced wallpaper! Red Nose Day is just around the corner. And increasingly numbers of posters advertising nose aerobics and other suitably noble events are appearing on the walls in work. 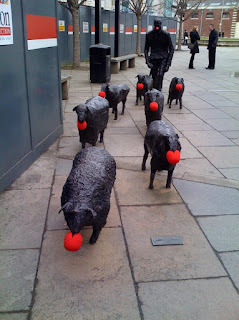 About a week ago, the much-sat-on sheep outside the Waterfront Hall got dressed up to show their support for Comic Relief. Coke Shy Hero captured the photo to the left (and Steve Barnes caught it too). Part of the joy of using any particular medium for communication is working out who the audience are, what’s appropriate to say. Just because social networking tools like Bebo, Facebook and Twitter - never mind blogs - seem informal and chatty doesn’t mean the normal rules of libel don’t apply. 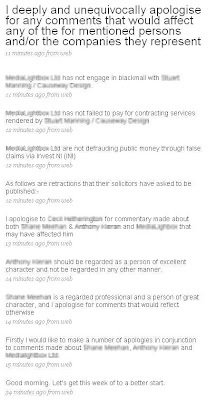 Many of your witterings will be in the public record, have influence, and any defamation can be visible to those you talk about and their solicitors! Sometimes best to learn (or be reminded) by other people’s mistakes.